Ben Veling, owner and operator of Timberwolf Tree Care, has been working with trees for over 20 years. Starting with a chainsaw and a pickup truck, he has built Timberwolf into what it is today: the premier plant health care/full service tree care operation in northern Michigan. Ben is currently one of only nine Board Certified Master Arborists (#MI0740B) in the state of Michigan; BCMA is the highest level of certification available within the industry. He has completed the American Society of Consulting Arborists' (ASCA) Consulting Academy and is on his way to becoming a Registered Consulting Arborist. 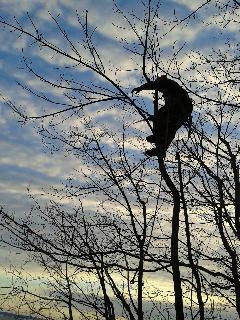 Ben has also become certified in Tree Risk Assessment Qualification (TRAQ). In addition to Ben's position as the owner and salesperson for the company, he has earned his certificate of Commercial Horticulture from Michigan State University. The voice on the phone is Molly, crew foreman and office manager. Molly does the scheduling of the work as well as all of the billing. She goes with the crew every day and supervises the work, as well as helping with decisions on site and ground crew duties. Molly also knows where Ben is at any given point in each day and is the go-to for answers to most questions. Molly is a Certified Arborist (#MI4132A) and also a certified pesticide applicator. Always on our crew there are Certified Pesticide Applicators, who adhere the laws of the State of Michigan as to what/when/where and why to apply the particular chemicals with which they are working. These dedicated individuals manage the health of over a dozen local private orchards as well as spraying trees for insects and fungi, treating lawns for weeds, ants and grubs, fertilizing trees, injecting ash trees for Emerald Ash Borer, treating oaks for Oak Wilt, spraying exteriors of houses for wasps and spiders and setting up exterior rodent control for properties in the late fall. They are a busy, busy bunch. With the applicators, supervisor and salesman are the climbers and ground crew, who do a lot of the grunt work. They are always a hardy bunch, working in all weather conditions and hauling all of the bits and pieces from the work zone to the truck. The members of the trim and removal creware also held to high standards of professionalism, each holding at least one certificate of education from the Tree Care Industry of America's Tree Care Academy.